Roma Cafolla was born in Derry, Northern Ireland, into a well known musical family and began composing at an early age. A life in the teaching profession gave way to ill health and it was then after a forced early retirement that her compositional talent blossomed. She has become an established composer and was a regular contributor to BBC "Children’s Hour". She was introduced to Leslie Craven (Principal Clarinet of Welsh National Opera) by her sister (herself a former member of Welsh National Opera) and this sparked a revival of her love of the clarinet and collaboration with him produced much of her recent music. Her music is lyrical, melodious, expressive, often passionate in mood with both Celtic and Italianate influences running through her family bloodline which is evident in her music. Her works include many for woodwind, strings and brass instruments and numerous ensembles of varied instrumentation. She has a particular love of song and has produced a wide portfolio with many different lyricists. She is a strong protagonist of music in education and interests include ballet, reading and gardening. Many of the works originally composed for clarinet and piano or clarinet and harp have been re-arranged to incorporate the virtuoso talents of friends Lana Trotovšek, Yoko Misumi, Katherine Thomas, Patrick King and Boris Bizjak. Roma also added pieces specially for this CD to enable recording engineer/producer Boris Bizjak to be part of the CD and to display the beauty of his flute playing. 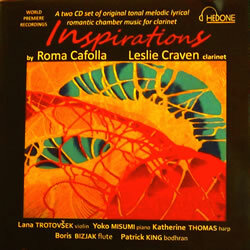 The double CD, titled Inspirations, is now available from Leslie Craven - www.lesliecraven.co.uk and from Roma Cafolla - www.romacafolla.co.uk. 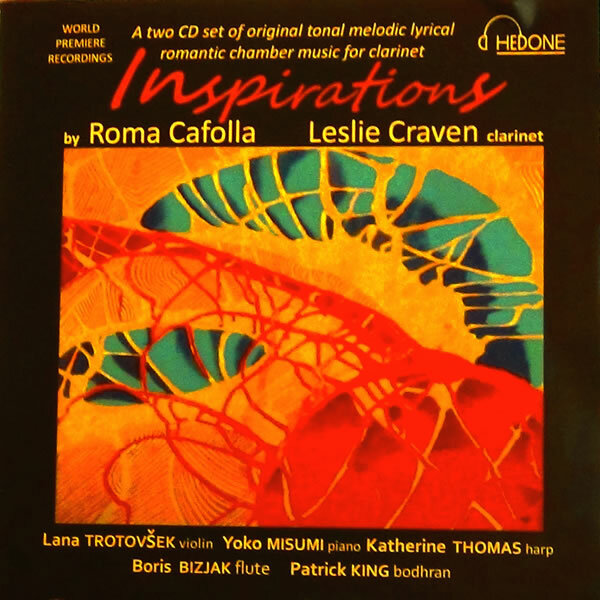 Roma Cafolla's music is currently published by Forton Music and Roma is prolific in her work, generating ideas for new compositions on a daily basis.